Making room for our little bean has entailed having a massive sort out. I’ve gone through everything we own. Reorganised, chucked, donated or sold stuff just to make space for a tiny human. This has even meant taking up a considerable amount of space over at the parental unit’s house as a temporary storage facility – which they are simply thrilled about as you can imagine. This forced me to go through all my old school work, photographs and memories in order to make space in their loft, and turned out to be one hilarious trip down memory lane. Aside from the photographs, (which I won’t share…anyone who went to High School with me, don’t panic, those cringe-worthy pieces of evidence are stored under lock and key!) I found a lot of my old art work from GCSE and A-Level. 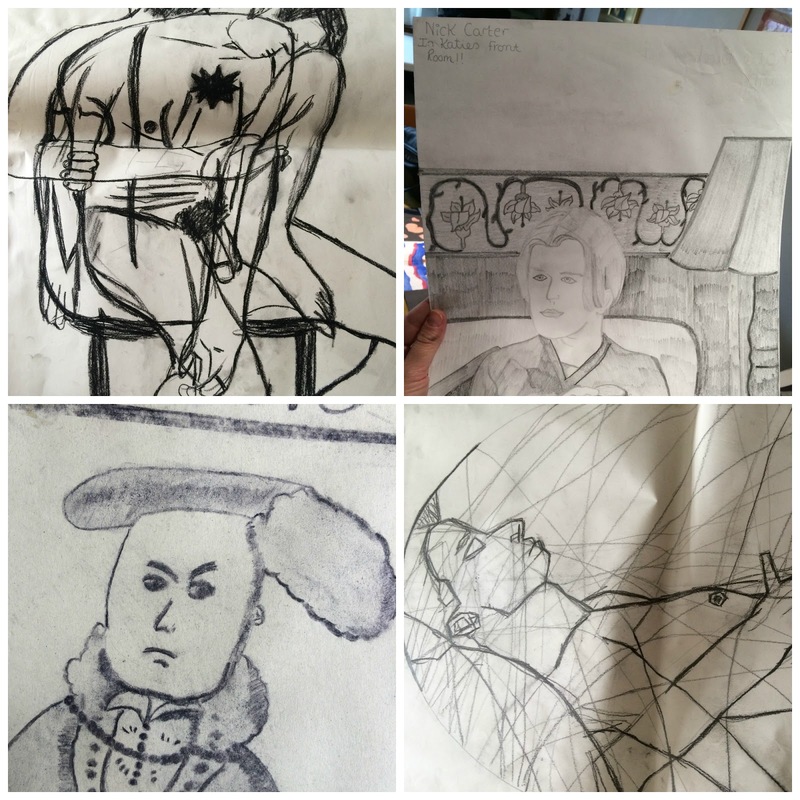 How I ever got a B is beyond me…just take a look at these masterpieces! Yes that is a man’s wotsit in the first picture from a life drawing class I took when I was 18. Yes that is Nick Carter from the Backstreet Boys sitting in my front room (I confessed my teenage obsession back here). Yes that is some Tudor with what appears to be sausage and mash on his head and no, that’s a sleeping man’s arm in the bottom right picture…cheeky. I wasn’t totally obsessed with drawing men’s bits back then. The Hubster feeling Baby Bean kick for the first time. His face was a picture and I cried happy, hormonal tears…as you do. Spending the weekend relaxing at our wedding venue with my family. The boys played golf, then girls lounged in the spa…it was bliss. Seeing Miss Molly Moo super exciting to receive a new Backbeats box. She loved her new turtle toy and sat patiently waiting to try some of the treats – unlike last time when she went a little crazy for those smelly dog treats…which you can watch here! We were invited along to a preview screening of Birthday starting Stephen Mangan and it was brilliant. You can read all about it in my review here and don’t forget to tune in to Sky Arts next Tuesday 9th June 2015 at 9pm to watch this hilarious, emotional comedy drama. What little things have made you smile this week…? Let me know in the comments below!